An European act that has been on the scene officially for ten years straight, VOODOO CIRCLE emerges from the studio yet again, giving us 2018's full-length opus "Raised On Rock". New vocalist Herbie Langhans lends his DIO-esque pipes to the lineup for the first time, also laced with a singing style slightly reminiscent of German sensation Udo Dirkschneider. The sound, overall, is a wonderfully crafted swathe of throwback material which reminds one of artists such as WHITESNAKE, DOKKEN, and the heavier moments of iconcic 1970s band RAINBOW. Love and the loss of love tend to be the recurring theme here, which is to be expected from an album such as this, but few have the ability to sing about these all-so-familiar subjects with the vigor and tenacity that this newcomer, Herbie Langhans, manages to utilize song after song on this passionately performed new record. "Raised On Rock" sets forth screaming with a track that is sure to bring a smile to David Coverdale's face entitled "Running Away From Love". The song itself does a nice job of letting one peek into the thriving landscape that the rest of the album is about to reveal, without giving away all of the secrets contained therein. Harmonized vocals bounce with vibrato over guitars that wail in perfect agony as the whammy bar tortures the strings, morphing them into voices of their own. The rhythm section drives the song with a furious beat, pounding away until the track's close. The album's next two tracks, "Higher Love" and "Walk On The Line", offer a glimpse of VOODOO CIRCLE's more Bluesy side. While the lyrics tend to cover familiar territory, they are sung in such a way that makes them nevertheless engaging and fun to listen to. It's the guitar work displayed by Alex Beyrodt that shines here, the Blues-inspired low end flowing over the drumbeat like water, and the lead sections exploding like a firework’s show finale, lending the perfect amount of chaos to each song. The guitar solos are absolutely stunning and end up being what set this album apart from so many others that dabble in the same formulaic Hard Rock sound. It's always akin to a breath of fresh air when a band is able to take something that's been done time and time again yet make it enjoyable by utilizing outstanding musicianship and real emotion in its execution. 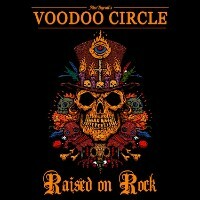 "You Promised Me Heaven", the fourth outing on "Raised On Rock", lets the listener discover another side of VOODOO CIRCLE. This track sounds like it comes from a completely different album. Steely guitars with a more western sounding tinge coat the song in atmosphere, and the more laid-back approach to the music in general provides a nice change of pace from the previous three tracks. "Just Take My Heart" speeds things up a notch and exhibits yet another style that is more comparable to the works of JOURNEY and FOREIGNER than the record's previous numbers. In fact, the record shows an audible appreciation for a slew of different musical genres, but never loses its original intention within its constant exploration. Its original intention is something plain and simple: It aims to rock your entire universe, and that is exactly what it does! The album's defining moment is most assuredly the track entitled "Dreamchaser", whose guitar work is just captivating. With a multitude of smaller bridging solos that are bound to make Yngwie J. Malmsteen ask, "How did he do that? ", the song crushes like a massive avalanche that never stops falling. This is the kind of guitar playing that has the ability to bring a tear to one's eye. All in all, what we experience while listening to "Raised On Rock" by artist VOODOO CIRCLE is a flashback worth having - one that we never want to recover from. A record like this is worth taking heed to, for it is rare indeed that something so diverse in its soundscapes comes along to garnish the world of Heavy Metal and Hard Rock in the way that this one has. Hope you all enjoy! 6. Where Is The World We Love?